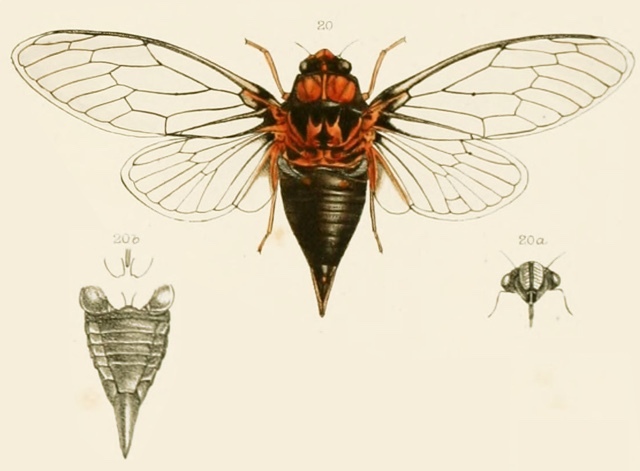 Tibicina casyapae (Distant, 1888) is a cicada found in India and Afganastan. Tibicina casyapae was formerly known as Tibicen casyapae. It was moved from the Tibicen Latreille, 1825 genus to the Tibicina Kolenati, 1857 genus. [female] Head black; margins of front, ocelli, and a small central basal spot, dull reddish; eyes ochraceous. Pronotum dull reddish, the margins and two central longitudinal lines black. Mesonotum black; two central ” antler “- shaped fasciae, the lateral margins, and the basal cruciform elevation, dull reddish, the anterior angles of the last black. Abdomen above black. Body beneath black, somewhat greyishly pilose; face red, its central longitudinal sulcation black; rostrum black; legs reddish, the femora streaked with black beneath. Tegmina and wings pale hyaline, their bases dull reddish, the venation blackish; the costal membrane of tegmina ochraceous. The face is large, but laterally compressed and strongly striated, with a profound central longitudinal sulcation. The rostrum about reaches the intermediate coxae; the legs are robust, and the anterior femora have a strong spine beneath at apex and a similar spine near base. Long. excl. tegm. [female] , 35 millim. Exp. tegm. 90 millim. Nast, J., 1972a. Palaearctic Auchenorrhyncha (Homoptera). An annotated check list. Warszawa: Polish Sci. Publ. 550 p. (records).